Blue Pikmin (青ピクミン? ), as their name implies, are a blue species of Pikmin that reside on PNF-404. 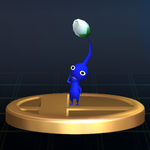 This type of Pikmin is present in all game modes of all three Pikmin games, and in all of them, it is the last type to be discovered. Besides coloration, these Pikmin are distinguishable from other Pikmin species by their pink mouths, a trait seen in no other Pikmin species. These mouths are used to take in water, which filters oxygen through the gills located on their cheeks. This gives them the astonishing ability to breathe both underwater and on dry land. Producing more Blue Pikmin can be easily done by dragging nutrients or animal carcasses to the Blue Onion (or the Master Onion), or by throwing other species into a Lapis Lazuli Candypop Bud. As with the other main types of Pikmin, their buds and flowers are white. Blue Pikmin being re-discovered in Pikmin 2. Only the Blue Pikmin and Bulbmin can safely traverse watery areas; any other type will simply flail around in panic before drowning. Winged Pikmin may move and carry objects above the surface of the water, but if thrown into a pool, they will not be able to swim. While in water, the Blue Pikmin behave almost the same as they do on land. If they are idle and see a nearby Pikmin drowning in water, they will quickly run to them, pick them up, and throw them to shore. However, they will not rescue Pikmin if they are a certain distance away, so they can't always be relied on. In Pikmin 3, this rescuing feature was removed, and Blue Pikmin now also have the ability to swim freely while in pursuit, something necessary to reach some enemies that lie above the ground level. Blue Pikmin seem to be the most balanced Pikmin species; they have average attack power, durability, mobility, digging speed and throw distance. Blue Pikmin have very little utility outside of water, as most enemies that pose water hazards can easily be defeated without Blue Pikmin. Interestingly, Blue Pikmin are more likely to die than other types in Pikmin 2, as noted here. The Blue Onion activating in Pikmin 3. 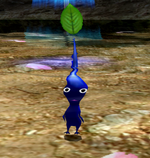 Blue Pikmin are the last species of Pikmin encountered by the player in all games. In Pikmin, Olimar finds the dormant Blue Onion in The Forest Navel, which proves to be a big help in the aquatic area, The Distant Spring. Their Onion is found near the massive stump holding the Automatic Gear, and is located inside a small pond. Like with the red and yellow Onions, a seed pops out when the Onion wakes up, which Olimar then plucks. The Blue Pikmin's ability to live underwater is immediately demonstrated, since the Onion, the seed, and the new Pikmin appear underwater during this event. In Pikmin 2, 5 Blue Pikmin are found in the Awakening Wood. This is first hinted at when the Onion stops spitting out seeds, but there are only a reported 95 out 100 Pikmin on the field. They are found chasing a few Wogpoles beyond an electric gate guarded by a Cloaking Burrow-nit at the north of the map. To obtain them, Olimar and Louie break down the gate with the Yellow Pikmin, and proceed to whistle them to take them under their command. Once again, their underwater prowesses are instantly noticeable, since they're found in a large lake. 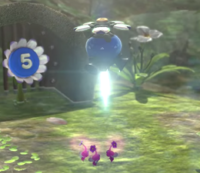 In Pikmin 3, the Blue Onion is found in the Garden of Hope, but can only be found after Louie has absconded from the Koppaites. The explorers chase after him, but instead find an Onion trapped under a Flukeweed. From this, the Blue Onion is found, and after it ejects a seed that is then plucked, the explorers discover the Blue Pikmin, which prove to be essential in finding Louie. As with the previous games, the Blue Pikmin are instantly shown to be able to withstand being underwater, since the Onion, seed, and newly-plucked Pikmin are underwater. Blue Pikmin are needed to recover the following objects, and to kill the following enemies, as no other Pikmin type can complete these tasks, not even with exploits. There are exploits that make it so Blue Pikmin are not needed to obtain any ship parts, defeat any enemy, etc. Shower Room: The entrance to the cave is blocked by a clog underwater. Submerged Castle: Only Blue Pikmin can enter this cave, as its entrance is underwater. Even with exploits, only Blue Pikmin are allowed to enter. The white gate in the Valley of Repose, after the Emergence Cave, can only be destroyed by Blue Pikmin, because it is in the water. The first clog in the Valley of Repose must be destroyed by Blue Pikmin in order to drain the lake and continue to the second half of the area. Searing Acidshock: The one inside the Calcified Crushblat is closed off by a dirt wall that is completely submerged in water. Portable Sunset: There is one in the Distant Tundra that is on a low branch above a pool of water. Upon throwing 8 Pikmin on it, it will fall into the water. Winged Pikmin can also be used to detach the fruit, but it'll land in the water regardless. Citrus Lump: The one in the Twilight River is found underwater. Another in the Garden of Hope is also underwater. Crunchy Deluge: Like the Citrus Lump, this fruit is located underwater. Sunseed Berry: There is one in the Garden of Hope that is underwater beside a dirt wall. Sputtlefish: The Sputtlefish always remains underwater, so it must be defeated by Blue Pikmin. Puckering Blinnow: These enemies are underwater enemies. Blue Pikmin are not mandatory for the following tasks but are recommended. Some of these cannot be completed without Blues unless exploits are used. Blue Pikmin are not needed for any ship part, but some can only be collected with Red/Yellow Pikmin using exploits. There are two main ones: the object nudging glitch allows one to push ship parts out of the water, while the drowning reset glitch allows Pikmin to travel large bodies of water without drowning. Other minor exploits and glitches include ending the day to make a ship part appear on the closest carrying waypoint in the following day, which can place ship parts in unintended places, and the ability to place a lying Olimar between a treasure and a wall to make him pop up on top of the wall, and going out of bounds. Positron Generator: The ship is on a Pearly Clamclamp on a beach. Although by using small islands on the beach, it is possible to attack the Pearly Clamclamp using Red or Yellow Pikmin, and the ship part can then be pushed out of the water with the object nudging glitch. Radiation Canopy: The path that Olimar needs to cross is blocked by a gate on a body of water. However, with precise throws, it's possible to throw bomb-rock Yellow Pikmin to the top of the gate, and destroy it without needing Blue Pikmin. Geiger Counter: In order to reach the Burrowing Snagret that holds the ship part, a cardboard box must be pushed out of the way, and Blue Pikmin need to be guided from a puddle to the backside of the box. Although it is possible to use other Pikmin to throw the box, either with long throws or by throwing them to the top of the box and guiding them to the back. Sagittarius: Two bridges must be built to reach the part, but one of them can only be reached by tossing Pikmin while in a large pond. Luckily, there is a small protrusion on the island that allows non-Blue Pikmin to shore on, and from there, they can be thrown at the bridge. To reach the bit of land, the Pikmin can just swim towards it from the mainland. Analog Computer: This ship part is submerged in water, although it can be taken out using the object nudging glitch. Number 1 Ionium Jet: This ship part is submerged in water. It can be pushed out with the object nudging glitch, but it is too resistant to the pushes to do so effectively. By luring a Male Sheargrub and using its corpse or a pellet, Olimar can push the pellet, which in turn pushes the ship part. By bringing it close to the bodies of water in the higher levels and ending the day, it is possible for the Ionium Jet to appear in the next body of water by the next day. Eventually, the ship part can be brought to land. Libra: Blue Pikmin are needed to activate the geyser that gives Olimar access to the first high ledge. Although it is possible to have other Pikmin types open the geyser: if they are guided towards it, they might land one or two hits before starting their drowning sequence. They can just be called back, and the process can be repeated until the geyser is enabled. Alternatively, one can use a pellet from a Shearwig to clip to the railing wall, and from there, walk up to the ship part and push it down. Anti-Dioxin Filter: The part is on a large pool of water, but with the object nudging glitch, it is possible to take it out without Blue Pikmin. Wollywog corpses can be used to help push the part, and a Breadbug dragging a Male Sheargrub corpse can be used to push the part mostly onto dry land. Interstellar Radio: The Puffy Blowhog containing this ship part is over water and the path to carry the ship part back to the ship goes through the large lake of water. By going out of bounds on the south using the Massage Machine, and attacking the Blowhog from dry land, and by nudging the ship part out of the water, it can be collected. Repair-type Bolt: This part is on top of a ledge. When it falls off, it will almost immediately land in the water. It can be nudged to dry land, however. Chronos Reactor: This part is located a long way across a pool of water. As part of the puzzle, the Blue Pikmin carrying this part must first become Yellow Pikmin. By using the Spotty Bulbear near the maze, Olimar can be pushed to the ledges out of bounds, and from there, lure a Swooping Snitchbug near where the Chronos Reactor is. Its corpse or pellets can be used to bring Olimar to the ship part's ledge, where it can then be pushed all the way out of the water section of the area and onto regular dry land. Number 2 Ionium Jet: This part is on top of a tall ledge that opens into water. By bringing Pikmin to the ship part's shore using the drowning reset glitch, it's possible to bring enough Pikmin to take the part out of the ledge. From there, it can be pushed to near the Pilot's Seat section, which will make it appear right next to the Pilot's Seat the next day. Since it takes too long to push normally, a Water Dumple corpse must be pushed instead, which in turn pushes the Ionium Jet. Gluon Drive: This part is opposite a wide river, and a bridge must be built from the other side. However, Pikmin can be tossed from the Zirconium Rotor's location. Zirconium Rotor: This part is behind a gate that is difficult to destroy without Blue Pikmin, but it can be done. Massage Machine: This part is across a large lake, with the bridge that must be built located on the opposite shore. However, by throwing Red Pikmin or Yellow Pikmin to the water and whistling them to the other shore, it is possible to have them build the bridge. Secret Safe: The island with the bridges is in the middle of the lake, meaning Blue Pikmin must traverse it to reach it. That said, it is not too hard to guide Red or Yellow Pikmin to the island, by whistling them to it while they're drowning. Goolix: Only Blue Pikmin can touch its body, but it's still possible to defeat the creature without them by throwing Pikmin when it stretches. Air Brake: Only Blue Pikmin can use the seesaw blocks that are underwater. With long throws and/or the high ledge glitch, Yellow or Purple Pikmin can access the ledge the treasure is on and carry it back safely. Decorative Goo: The path to carry the treasure back to the ship goes through water, but by using a certain glitch, it's possible for treasures to be carried in water with non-Blue Pikmin during cutscenes. Another glitch called charging also helps minimize how long the treasure is underwater for, meaning the treasure can be carried through the water in the duration of just one cutscene. Onion Replica: Same as the Decorative Goo. Optical Illustration (US) / Abstract Masterpiece (Europe): Same as the Decorative Goo. Massage Girdle: Same as the Decorative Goo. Wogpole: Although this aquatic enemy can jump onto land and become vulnerable, the chances of this happening are quite slim. In order to access the southern part of the Wistful Wild, an underwater clog must be taken down. The only way to bring things back to the landing site is to build the bridge on the other side of a lake; provided the player has destroyed the clog, they can go around and build it with any Pikmin type, but if not, Blues will have to cross the lake and build it. Juicy Gaggle (Twilight River): It is possible to get them with Winged Pikmin, but Blue Pikmin will not require defeating the Arachnode. Wogpole: Although this underwater enemy can jump onto land and become vulnerable, the chances of this happening are quite slim. Skeeterskate: Skeeterskates can be killed by any Pikmin, but non-Blues will fall in the water and start to drown right after. Quaggled Mireclops: When it stomps its feet, it makes puddles of water. Using Blue Pikmin to attack the feet is recommended, as they cannot drown in the puddles of water. Blue Pikmin appear in Super Smash Bros. Brawl and Super Smash Bros. for Nintendo 3DS and Wii U as kinds of Pikmin that Olimar can pull from the ground via Pikmin Pluck – his standard special move – as well as trophies. They are the only Pikmin that don't drown in water, and are more durable than other types of Pikmin (besides Purple Pikmin). They also throw opponents the farthest with Olimar's grab attack. They can withstand water moves like Mario's F.L.U.D.D. or Squirtle's water gun. In Brawl, Olimar is most likely to pull up a Blue Pikmin if he is on a water-based surface, such as a cloud or ice. Blue Pikmin also have a sticker of them in Super Smash Bros. Brawl. “A type of Pikmin, which are curious creatures that follow and obey the person who picks them. If you take advantage of this trait, you can get them to help Capt. Olimar and Louie. The blue Pikmin are at home in water and cannot drown. Need to retrieve an object underwater or cross a water hazard to disarm a trap? Blue Pikmin are just the allies you need. 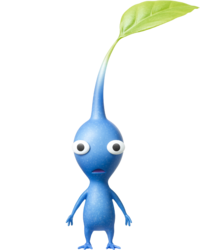 “This blue Pikmin walks around with its mouth ajar. At home in the water, they're very helpful when objects are submerged and need retrieving. In Smash Bros., blue Pikmin have defense second only to purple Pikmin. They are also able to do more damage when thrown, so don't be shy about hurling them at foes. “The things that make blue Pikmin different from all the other Pikmin are that they have mouths and that they're pretty good swimmers. They're slightly hardier than most other Pikmin, and they do more damage when you throw them. So, as soon as you get one of these, make sure to throw it right at someone straight away! Finding the first Blue Pikmin in Pikmin (leaf). Finding the first Blue Pikmin in Pikmin (bud). Finding the first Blue Pikmin in Pikmin (flower). A Blue Pikmin being thrown. The stages of a Blue Pikmin. Artwork of a Blue Pikmin being plucked by Captain Olimar. A Blue Pikmin in the water. Clay art of a Blue Pikmin. Clay art of a Blue Pikmin in its second stage of maturity. Clay art of a Blue Pikmin being thrown. A Blue Pikmin carrying a pellet. A Blue and a Yellow Pikmin carrying a pellet. The three stages of a Blue Pikmin's maturity. A Blue Pikmin and a Yellow Pikmin carrying a Juicy Gaggle. Artwork of a Blue Pikmin riding atop an Iridescent Flint Beetle. Finding the first Blue Pikmin in Pikmin 3 (leaf). Finding the first Blue Pikmin in Pikmin 3 (bud). Finding the first Blue Pikmin in Pikmin 3 (flower). A screenshot from Pikmin 3 featuring some Blue Pikmin in water. The data file explaining Blue Pikmin's breathing underwater. The data file explaining Blue Pikmin's swimming. A Blue Pikmin constellation on the day selection screen. The Pikmin's e-card, #00 (1st blue card). A Blue Pikmin in Super Smash Bros. Brawl. The height of a Blue Pikmin. Blue Pikmin's abilities explained in the manuals of Pikmin, Pikmin 2, Pikmin 3, New Play Control! Pikmin and New Play Control! Pikmin 2. This page was last edited on January 4, 2019, at 17:13.